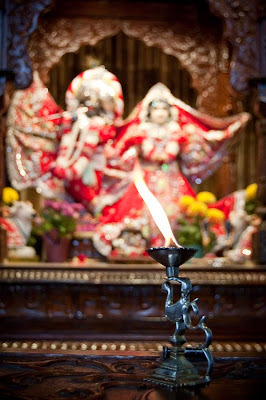 A Unique Perspective of Our Altar ~ The Toronto Hare Krishna Temple! Sometimes all it takes is a little creative perspective, and suddenly an everyday sight can be given a new twist. Resident devotee, Manish Thorat, snapped this nice picture of our beautiful Deities with the focus on the lamp that is offered during one of the aratis (ceremonies) of the day!